The Outsunny 8' x 7' Retractable Awning is the perfect choice for anyone in the market for a manually operated retractable awning. Since it requires no electricity you can hang this awning anywhere you need it, without having to worry about cords, outlets, or batteries. 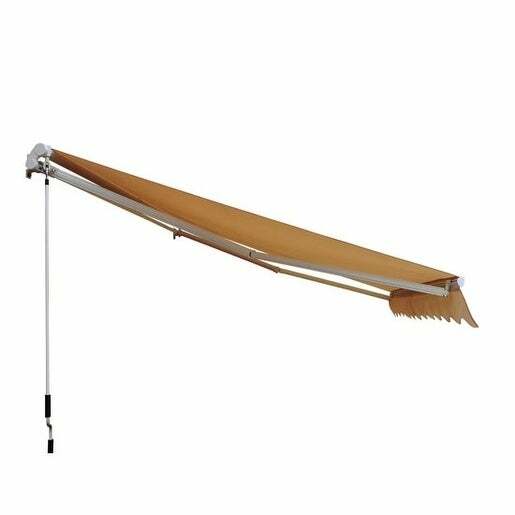 The long 63 hand crank opens the awning smoothly and quietly. You can mount this awning on walls, above doors, or anywhere you need it. The pre-drilled holes and included mounting hardware make installation a snap. Designed to keep the sun off you and your home, an awning can do a lot more than just provide shade. By reducing the heat going into your home an awning will help keep your home cooler and possibly even reduce your air conditioning bills! All in all, the Outsunny 8' x 7' Retractable Awning is a superb value that just can't be beat. Dimensions 96.0 In. X 84.0 In. X 5.0 In. Specs did not match up to parent's patio so we could not install. I never saw the item but I'm sure would've received 5 stars otherwise. The color and quality appear to be up to par. "How well does it seal to the wall, wanting to keep rain off of french doors. 2. When open, does it have to be fully extended? Or can it open partially? Thank you in advance!"